This land we call Pejuhutazizi Kapi (the place where they dig for yellow medicine) has been the homeland for our people, the Dakota Oyate (Nation), for thousands of years. We have always occupied this area bordering the Minnesota River Valley, with the exception of a short period of time in the late 1800's following the U.S./Dakota Conflict of 1862. At that time, the Dakota were either exterminated, forcibly removed to reservations located somewhere else, or voluntarily fled to avoid harm. Many Dakota died during those difficult years. Some of those who survived the forced removal defied the state and federal governments by not remaining on the assigned reservations located outside of Minnesota, but rather chose to return to our ancient homelands in the Minnesota River Valley. In 1938, 746 acres of original Dakota lands in Minnesota were returned to our people, and the Upper Sioux Indian Community came into existence. 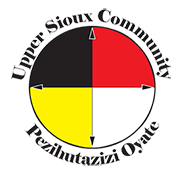 Provisions for governing the Upper Sioux Community were adopted, and a Board of Trustees was elected to carry out the responsibilities identified in these Provisions. In 1995, the Provisions were modified and the governing document is now called the Constitution of the Upper Sioux Community. Since its formal designation as an Indian community, Upper Sioux has struggled with poverty, substandard housing, inadequate health care, and the subtleties of racism. Tribal leaders continually strived to improve the standard of living and the quality of life on the reservation. The population was small, and Upper Sioux's share of program monies from the federal government was minimal, yet elected tribal leaders still managed to provide "bare-bones" programs in housing, health care, and education. Through the 1970's and 80's, conditions improved very little, despite many vocal supporters, both Indian and non-Indian, and we continued to struggle for survival on our small tact of land along the Minnesota River. By the late 1980's the legal standing of tribes as sovereign nations had been acknowledged in the highest federal courts. In 1990, following these court decisions, the Upper Sioux Community did as many other tribes had done—we exercised our rights as a sovereign nation to capitalize on a financial opportunity by building and opening Firefly Creek Casino. In the years since, our businesses have helped to revitalize and energize the Upper Sioux Community, allowing us an opportunity to obtain economic independence. Through obtaining an additional 654 acres of Dakota ancestral lands, the community can work towards meeting the growing demands of an increasing population, now at 482. We are finding ways to preserve our dignity, our culture and our traditions, free from the burden of meeting basic survival needs. Total land base stands at 1,440 acres.